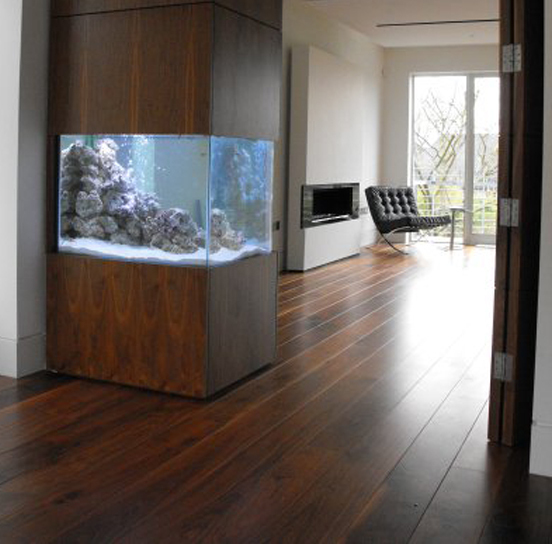 On this project our client was looking for a bespoke home aquarium which, when the folding doors are closed, acts as a room divider aquarium between two lounge areas. As a double aspect aquarium this means that both sides of the room benefit from it. The aquarium was set up with ocean rocks and coral sand although it is a freshwater tropical aquarium. It has since been stocked with cichlids which are a colourful and interesting freshwater fish. The filtration for the aquarium is concealed in the base below and comprises a large external filter, an external heater and an ultraviolet steriliser (uv), all of which ensure that the water is kept at the highest quality for the fish.